Recent evidence suggests that achieving significant reductions in malnutrition and stunting in high-burden countries will require collective action across development sectors. In a project that is undertaking both agriculture and nutrition activities, who is "in charge" of seeing both sides work toward a common goal? With development organizations being pushed to link agriculture and nutrition, how are we really designing and measuring "integration"? 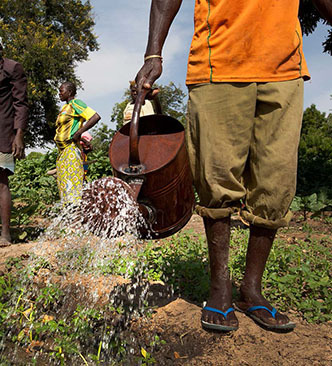 This SPRING webinar highlighted a recent SPRING qualitative study conducted in Burkina Faso, which examined the perspective of different stakeholders working in a nutrition-focused homestead food production project run by Helen Keller International. Study authors Jody Harris (IFPRI) and Aaron Buchsbaum (World Bank, formerly with SPRING) presented the study rationale and discuss several lessons that emerged from field interviews—including a proposed ‘typology’ of integration that may assist program designers and planners in linking multisectoral activities. SPRING Program Officer, Alyssa Klein provided a response to the presentation based on SPRING recent experience in documenting integration efforts in Guatemala’s Western Highlands Integrated Program.